The reverse creaming method used in this recipe is familiar to anyone who worked through Rose Levy Beranbaum’s The Cake Bible. My only quibble was that this particular recipe took a long time to bake and even so I under baked mine a little. The centre of my cake was a bit underdone. As for the frosting, it was a classic Swiss meringue buttercream. 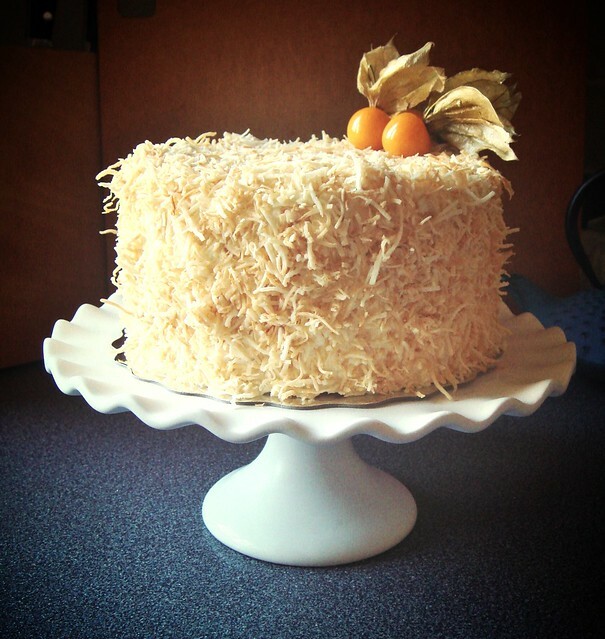 I personally prefer the volume of Italian meringue buttercream but this was much simpler. 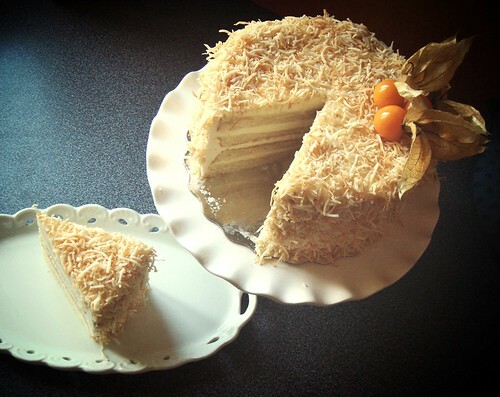 It was fluffy and laced with more cream of coconut. This cake called for many of the skills I acquired over the years and I am proud of the result. I still remember the days when I could not split nor level a cake layer without turning all lopsided. Or how about those frustrating hours of trying to frost a cake over and over again but it still looked uneven? 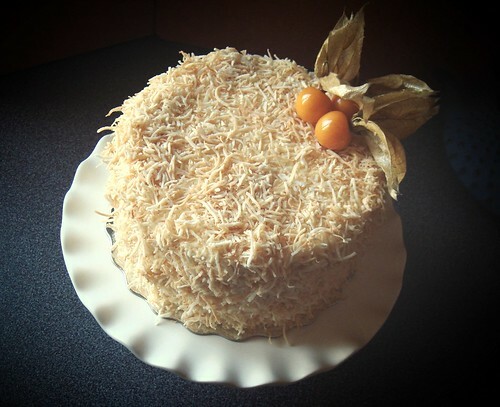 Even covering a frosted cake with crushed nuts or coconut used to be a challenge with bare spots staring back at me and teasing me of my inadequate skill. A seemingly simple layer cake can take years of practice to get it just right. 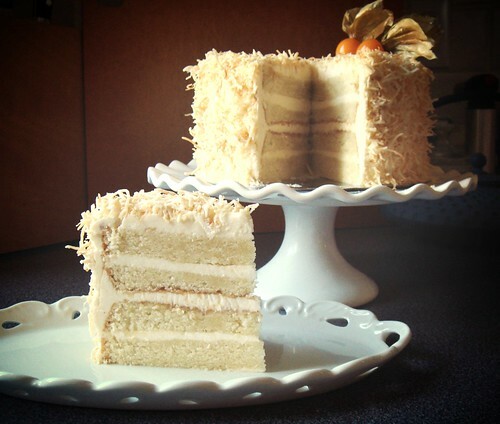 I loved the decadent look of a four layer cake. It felt truly celebratory even though I was not in person to enjoy my own creation. 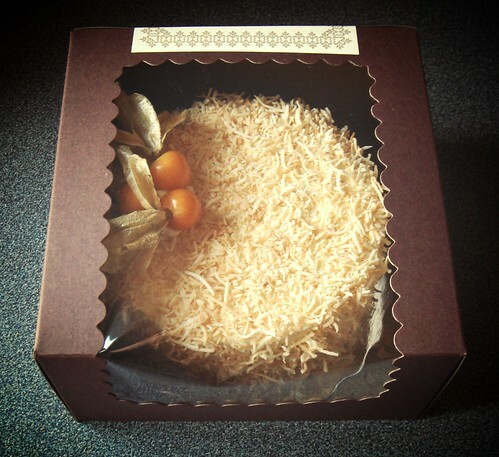 Dad and I met for dim sum lunch and I presented the cake like a gift in the prettiest window cake box. It just felt more appropriate for him to enjoy the cake later with his family than to eat it on the spot. It’s been over a decade since he remarried but mentally I still have trouble recognizing the fact that I have step siblings. Modern family is very complicated indeed. As for the second cake, I brought it to godmom’s restaurant to share with the kitchen crew. I took the opportunity to chat with her about the latest upheaval in my personal and professional life. It was comforting to hear words of encouragement and practical advices from more experienced elders. Cakes do have the power to bring people together, celebration or not.